PA-18 special now a Toss-up; Democratic incumbents in strong position; and what about Paul Ryan? — With less than a week to go, the PA-18 special election moves from Leans Republican to Toss-up. — In addition to that ratings change, we are making 25 other changes in the House, all in favor of Democrats. — No Democratic incumbent is now rated worse than Likely Democratic, a nod to the reality that in a Democratic-leaning environment it will be difficult for Republicans to dislodge many or perhaps even any Democratic incumbents, though there are a handful of Democratic open seats that are more viable Republican targets. — After these ratings changes, for the first time this cycle we have fewer than 218 seats (the number needed for a majority) at least leaning to the Republicans. — Making his debut in our competitive House ratings is the chamber’s most powerful member, Speaker Paul Ryan (R, WI-1). While his district is competitive but clearly Republican-leaning on paper, this shift mostly reflects uncertainty surrounding his future. Amazingly enough, the special election in Pennsylvania’s 18th Congressional District now looks like a Toss-up. That’s one of 26 House ratings changes we’re making this week, all in favor of Democrats. — Democrats have been consistently overperforming Hillary Clinton’s 2016 presidential performance in special elections held since Donald Trump’s election. My colleague Geoffrey Skelley has been tracking these elections, which are mostly for state legislative seats but also include a handful of congressional specials, and he calculates that Democrats have been running on average 13 points ahead of Hillary Clinton’s 2016 margin in the nearly 90 races held so far featuring a Democrat and a Republican. — That speaks to the overall political environment, which clearly favors Democrats right now. — Looking specifically at PA-18, former federal prosecutor Conor Lamb (D) has run a stronger campaign than state Rep. Rick Saccone (R). One way to measure that is fundraising: Lamb has raised $3.9 million while Saccone’s tally is only about $920,000. As a result, Republican outside groups have had to dump more than $10 million into the race to try to rescue Saccone, including $3.5 million from the National Republican Congressional Committee (the Democratic Congressional Campaign Committee, by comparison, has only kicked in less than a tenth of that). But because candidates get better rates for television ads than outside groups do, their money doesn’t go as far as Lamb’s does: While Republican entities (Saccone plus outside groups) have outspent Democratic entities (Lamb plus outside groups) by more than two-to-one overall, that has only translated into a less than three-to-two advantage in terms of actual television ads run, according to a tally by NBC News. — Additionally, as National Journal’s Josh Kraushaar shrewdly observed in his PA-18 preview, Republicans have scaled back their advertising touting their tax cuts in this district, perhaps a sign that GOP plans to run on taxes this cycle are not as promising as the party hopes. — PA-18 isn’t as Republican as the presidential topline suggests. Democrats still hold a party registration advantage in the district, and while plenty of those “Democrats” voted for Trump and for their former Republican incumbent, Tim Murphy, they may be open to backing their old party from time to time. Lamb’s stronger campaign has perhaps allowed him to activate these lapsed Democrats. A recent Lamb ad is a moving but largely content-free paean to public service, and he has tried to create distance between himself and the national Democratic Party by saying he does not support Nancy Pelosi as the Democratic House leader and that he did not support an assault weapons ban in the aftermath of a horrific Florida school shooting. Saccone, meanwhile, is probably to the right of the previous incumbent, Murphy, who enjoyed labor support. Saccone’s declaration that he was “Trump before Trump was Trump” probably doesn’t play all that well in the Trump-skeptical Allegheny County (Pittsburgh) portions of the district. While this is a district in Appalachia, it does not have stereotypically Appalachian demographics: It is in the top third nationally in median income and has above-average four-year college attainment. Put it all together, and you’ve got a tight race in a district that not only voted for Trump, but was in the top third of all districts in terms of GOP lean in 2016. In a sense, we don’t think it really matters all that much who wins, in large part because the district is going to be defunct effectively as soon as the election is over anyway. Assuming the U.S. Supreme Court does not throw it out — a safe assumption, we think — a new map created by the Democratic-controlled Supreme Court of Pennsylvania is set to replace the state’s Republican-drawn map this fall. We analyzed the map in full a couple of weeks ago, and Democrats are set to benefit to at least some degree. Whether Saccone wins or not, we wonder if a loss (or a close call) might have some effect on Republican candidate recruitment and/or incumbent retention. Republicans scored a recruiting victory in the Senate a few weeks ago when Rep. Kevin Cramer (R, ND-AL) decided to challenge Sen. Heidi Heitkamp (D-ND) after previously ruling it out. Ultimately, only Cramer knows exactly why he decided to take the plunge, but we suspect a modest uptick for Republicans after the State of the Union, both in terms of President Trump’s approval rating and the House generic ballot, contributed to his decision. The Republican position has eroded again since then, and the Democratic lead in the House generic ballot is back up to nine points after it dipped to around five or six a few weeks ago in the FiveThirtyEight and RealClearPolitics averages. Now, perhaps if Saccone wins going away — high single digits or more — it would reassure rattled Republicans. That seems unlikely; the most recent public polls, from Emerson College and Gravis, respectively showed Lamb up by three points and Saccone up by three. A close result seems likely, which to us is a Democratic win regardless given the lopsided Republican outside spending edge and the generic lean of the district. Looking ahead to November, and western Pennsylvania House elections under the new map, Lamb appears likely to run in the new PA-17 against Rep. Keith Rothfus (R) whether he wins or loses on Tuesday. In anticipation of that possibility, we’re moving PA-17 from Leans Republican to Toss-up — Trump won the new district by less than three points, and Lamb represents a formidable challenger to Rothfus whether he is a sitting incumbent or not. Saccone, again perhaps regardless of the outcome, seems likely to run in the new PA-14, a Safe Republican seat that is considerably more Republican than even the current PA-18. So the new incumbent of PA-18, whoever that is, will be running in new turf in November. Speaking of the fall election, we have a couple dozen additional ratings changes to announce this week. One major factor in this week’s ratings is our belief that while Republicans may pick off a few seats held by Democrats this cycle, the reelection rate for Democratic incumbents in the fall is likely to be extremely high, if not unblemished. One would not expect the Republicans to make much hay against Democratic incumbents in what should be a Democratic-leaning environment in the fall. Recent history informs this analysis. In the GOP wave years of 2010 and 2014, Democrats knocked off just two Republican incumbents in each of those two general elections, and there were extenuating circumstances in each instance. In 2014, Democrats defeated then-Reps. Steve Southerland (R, FL-2) and Lee Terry (R, NE-2), both of whom made boneheaded comments that hurt their chances. In 2010, Democrats beat then-Reps. Joseph Cao (R, LA-2) and Charles Djou (R, HI-1), both of whom were largely accidental winners in overwhelmingly Democratic districts: Cao beat an indicted Democratic incumbent in 2008, and Djou briefly held his seat thanks to a plurality victory in an all-party special election held earlier in 2010. In 2006, Republicans did not beat a single Democratic incumbent in the midst of that year’s Democratic wave, and even in 1998 and 2002 — two years where the presidential party bucked history to actually net House seats in a midterm — only two non-presidential party incumbents lost in 2002 and five in 1998, according to Vital Statistics on Congress. Additionally, none of this cycle’s potentially vulnerable Democratic incumbents are embroiled in a major scandal or were accidental winners in 2016 (though several won by small margins), and while many of them face potentially credible Republican challengers, the GOP candidates by and large have not distinguished themselves in fundraising or otherwise. So we’re upgrading every single Democratic incumbent to at least the Likely Democratic category, and moving several Democratic incumbents off the competitive board altogether. That’s not to say one or more won’t fall back into a more competitive category later this year — certainly someone very well could in the event of a strong, late-breaking Republican candidacy or a major gaffe or scandal — but for now every single Democratic incumbent seems like at least a decent favorite in the fall. We’re moving Reps. Ami Bera (D, CA-7), Tom O’Halleran (D, AZ-1), and Stephanie Murphy (D, FL-7) from Leans Democratic to Likely Democratic, and we’re moving Reps. Dave Loebsack (D, IA-2), Ann Kuster (D, NH-2), Sean Patrick Maloney (D, NY-18), Tom Suozzi (D, NY-3), and Ron Kind (D, WI-3) from Likely Democratic to Safe Democratic. If a Democrat was in the White House, many or all of these members would be Republican targets. Republicans still hope to push many of them this fall, but we’re just skeptical of their ability to do so given history and the overall environment. Of all of these changes, Bera is probably the closest call — he barely won in both 2014 and 2016, and he has had to deal with the fallout of a campaign finance scandal that sent his father to prison. But memories of that scandal are likely fading, and he benefits, just like every other Democrat, from Trump being in the White House. A possible exception may be if first-term Rep. Ruben Kihuen (D, NV-4) decides to run for a second term after retiring earlier this cycle because of sexual harassment accusations. The Nevada Independent reported Wednesday that Kihuen might be reconsidering. We currently list his open seat as Leans Democratic. As of right now, the most endangered Democratic incumbent in either a primary or general election is probably Rep. Dan Lipinski (D, IL-3), a cultural conservative and one of the only anti-abortion Democrats in Congress. Lipinski faces a seemingly stiff primary challenge from a more liberal Democrat, Marie Newman, in a district that the eventual Democratic nominee will hold in the fall (that nominee better, given that the only Republican who filed is a perennial candidate and an actual Nazi). Public Policy Polling, a Democratic polling firm, has the primary essentially as a dead heat, although it conducted the poll for NARAL Pro-Choice America, which is backing Newman. The primary is March 20. Republicans do still have five open Democratic seats to target, including prime opportunities in two Minnesota districts Trump carried by about 15 points apiece, MN-1 and MN-8. One other open Democratic seat, NH-1, moves from Toss-up to Leans Democratic because the Democratic field looks stronger than the Republican field and, while New Hampshire is unpredictable, it seems likelier to swing Democratic than Republican this year. One of the Democratic candidates is Levi Sanders, son of Sen. Bernie Sanders (I-VT), although the younger Sanders doesn’t live in NH-1 and starts the race as a considerable underdog to other contenders for the Democratic nomination. 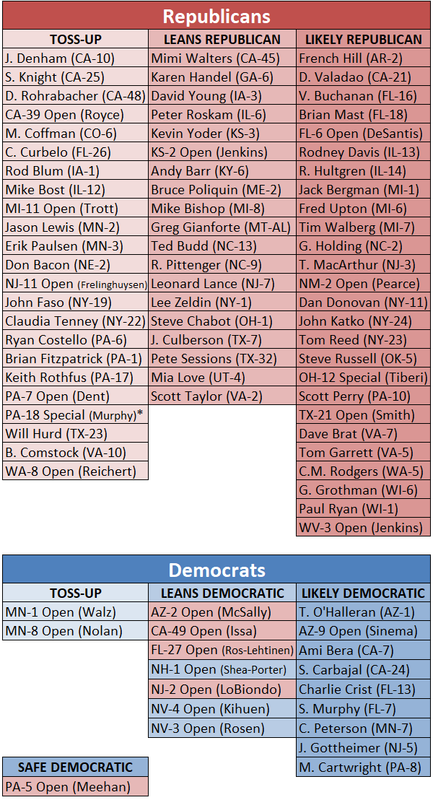 In addition to the new PA-17 and the soon-to-be defunct old PA-18, we have three additional Republican Toss-ups to add to a growing list of 50-50 races: Reps. Rod Blum (R, IA-1), Mike Bost (R, IL-12), and Erik Paulsen (R, MN-3). The first two, Blum and Bost, represent working-class districts with down-ballot Democratic strength that swung to Trump in 2016. Both should face strong opponents and the prospect of a Democratic snapback later this year. Brendan Kelly (D), a local state’s attorney, is set to challenge Bost, while Blum awaits the winner of a contested Democratic primary. Meanwhile, Paulsen represents a more affluent district in the Twin Cities suburbs where Trump underperformed in 2018. Paulsen is likely to face Dean Phillips (D), a member of a powerful Minnesota business family. The moves here are not related to a specific new development, but rather represent a fresh assessment of these races that takes into account what we believe is a challenging environment for Republicans in districts that both moved toward and away from Trump in 2016 relative to their previous presidential voting. The same applies to several other Republicans who are also moving to more competitive categories this week: Reps. Mike Bishop (R, MI-8), Ted Budd (R, NC-13), Robert Pittenger (R, NC-9), Lee Zeldin (R, NY-1), Steve Chabot (R, OH-1), and Pete Sessions (R, TX-32) all move from Likely Republican to Leans Republican. These incumbents seem likely to face credible challengers, and Democrats have had success in some of this territory in the recent past. Zeldin in particular stands out as someone who may be a key Democratic target if only because his Suffolk County seat has been perennially competitive. Sessions, a former chairman of the National Republican Congressional Committee, is a very formidable longtime incumbent, but Tuesday’s Texas primary did demonstrate an urban/suburban Democratic energy in terms of significantly improved turnout from the most recent comparable election (the 2014 midterm). That may not be enough to change the statewide dynamic, where Republicans have long ruled the roost, but members like Sessions and another longtime Texas Republican, Rep. John Culberson (R, TX-7), may be endangered in districts narrowly carried by Hillary Clinton in 2016. The Democratic primaries to face both Texas incumbents are going to runoffs: Former NFL player Colin Allred (D) more than doubled the vote of his closest competitor for the right to face Sessions and is likely a big favorite in the May 22 runoff, while attorney Lizzie Pannill Fletcher (D) and activist Laura Moser (D) will battle to face Culberson. The Democratic Congressional Campaign Committee clearly prefers Fletcher, and the committee intervened (some would say ham-handedly) against Moser a couple of weeks ago. Moser ended up getting about 24% of the primary vote, second to Fletcher’s 29%, but Moser’s level of support grew from 22% in the early voting to 26% of the Election Day vote, perhaps suggesting the DCCC brouhaha actually helped her improve her standing in the latter stages of the race. Meanwhile, Reps. Vern Buchanan (R, FL-16), Jack Bergman (R, MI-1), Fred Upton (R, MI-6), Tim Walberg (R, MI-7), and Steve Russell (R, OK-5) move from Safe Republican to Likely Republican. Russell in particular may seem like a curious addition, but Democrats have had some of their best special election performances in Oklahoma so far this cycle, and the Oklahoma City-based district shifted from 59%-41% for Mitt Romney in 2012 to 53%-40% Trump in 2016, perhaps indicating some anti-Trump sentiment that could contribute to a Democratic opening in a good year. Noah Rudnick, a sharp young analyst, recently published a long piece looking at OK-5 and questioning why House handicappers were ignoring it. We were sufficiently intrigued to include it in our ratings. The other four Safe to Likely Republican districts mentioned, three in Michigan and one in Florida, are also deep sleeper Democratic targets. One final change of note: We’re moving Speaker Paul Ryan (R, WI-1) from Safe Republican to Likely Republican, too, for a variety of reasons. The first is that Ryan’s district is actually competitive, on paper at least: Barack Obama narrowly won it in 2008, Mitt Romney (with Ryan as his VP nominee) carried it by four points in 2012, and Trump won it by 10 in 2016. So the district seems to be trending Republican — but, remember, we’re in an electoral period where Democrats are making districts Trump won by 20 points into Toss-ups, like PA-18. Still, Ryan has been untouchable, never winning less than 55% in his 10 victories dating back to 1998. Ironworker Randy Bryce (D), one of Ryan’s potential general election challengers, has become a minor celebrity on the left, and he raised more than $1 million in the last quarter, a lot of money for a House candidate (though he burned through almost all of what he raised last quarter, which calls into question how he is running his campaign). Still, in a big wave environment, it’s not impossible that Ryan could be vulnerable, particularly because voters don’t seem to reward senior leaders the way they used to (it’s probably not a coincidence that Ryan’s weakest general election performance in the House came in 2012, when he was also on the ballot as the vice presidential candidate and thus a highly nationalized figure). However, the main reason we’re including Ryan’s district on the list is to account for the possibility that he may not even be running in the fall. A few months ago, some well-connected congressional reporters, Politico’s Tim Alberta and Rachael Bade and Huffington Post’s Matt Fuller, suggested Ryan was not long for the House, and in late January, Ryan was non-committal about running for reelection, and Wisconsin’s filing deadline is not until June 1. Could Ryan decide not to run? Or might he run this year and then resign after winning reelection, perhaps necessitating a special election in 2019? It’s hard to say, but Ryan may keep us all guessing for awhile, because if he retires he could prompt even more of his colleagues to also retire. Ryan is also a vital (and very strong) fundraiser for his caucus, and he might not raise as much if donors explicitly knew he was heading for the exits. Despite all these changes, we still think the odds of a House flip are only about 50-50, although those odds are probably generous to Republicans at this point. But we’re also cognizant of the fact that there’s still a long way to go. After these ratings changes, for the first time this cycle we have fewer than 218 seats (the number needed for a majority) at least leaning to the Republicans. Right now, we have 213 seats Safe, Likely, or Leaning Republican, while there are 197 Safe/Likely/Leaning Democratic seats. 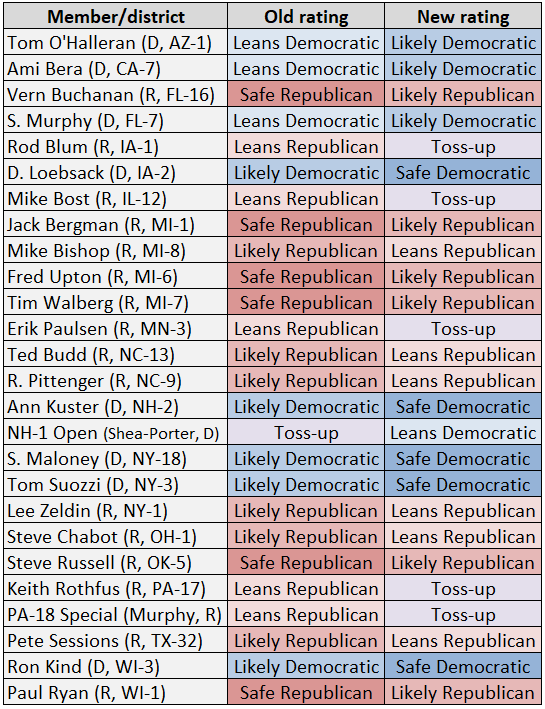 That leaves 25 Toss-ups, and Democrats would need to win 21 of them to win the House. In all likelihood, though, if Democrats win a House majority, they will win at least a few seats in the Leans, Likely, or even Safe Republican columns, as we noted in a piece we published recently outlining a potential path to a Democratic majority. And while a Democratic majority is far from certain, the expanding battlefield also illustrates that the Democrats have the potential to not just win the House, but net a significant number of seats beyond the 24 they need if conditions worsen for the Republicans.